On Friday we had the huge pleasure of visiting Ashley Primary School in Walton on Thames, Surrey, a school which has been lauded as a model of sustainability in action and within a few minutes of entering the building we could see why. Invited into the headteacher’s office, we found ourselves sitting besides a table which held the largest bunch of beetroots we’ve even seen. It had just been picked from the school garden which is tended by the children along with excellent support from a professional gardener. A tour of the buildings outside gave us the first views of the solar panels and solar PVs which are on each of the four school buildings and all the data is displayed prominently in the front reception so that the output of each building is visible. Richard Dunne, headmaster of Ashley Primary School for 12 years is clearly a visionary leader but it is the children who are the architects of all the activity in the school; it is they who are tasked with achieving energy targets and discovering new ways of reducing energy usage which they actively embrace. Watch this video of Richard Dunne at Greentalk, Bristol in which he gives us some entertaining and enlightening ways in which Ashley Primary School students are agents for change. We left inspired and hopeful and with the burning question on our lips, how can we share this best practice with as many schools as possible? Well here’s a great way all schools can take a step forward and make clean energy an everyday part of school life courtesy of Friends of the Earth. Running on sun could make cash-strapped schools between £1,500 and £8,000 a year in electricity savings and payments for generating clean energy. That’s more money to spend on other things like school trips and sports equipment. Click on Friends of the Earth Run on Sun and you can hear exactly how Saltaire Primary School have embraced solar panels and the impact it has had. I also loved this blog from a parent who talks about his experience of getting solar into his childrens school. Then Friends of the Earth would love to hear your story and we’ll happily share it on air too. Email: solarinfo@foe.co.uk, or go to Facebook Friends of the Earth, England, Wales and Northern Ireland or send them a tweet @wwwfoecouk. And not only that but today Friends of the Earth have launched a unique opportunity for primary schools across England, Wales and Northern Ireland to win solar panels, crowdfunded by Friends of the Earth supporters. The competition, which launches today, invites pupils to submit creative entries, such as artwork or film, demonstrating why they’d love their school to be powered by solar energy. The winning school, chosen by public vote at the start of the new year, will receive a solar installation free of charge. It’s the first time that Friends of the Earth has crowdfunded a renewable energy project. 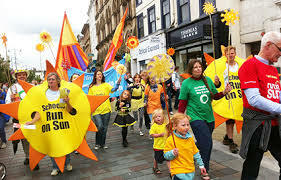 Its new Run on Sun campaign, supported by players of People’s Postcode Lottery aims to make it easier for schools to benefit through solar power. For full details of the competition, then visit Friends of the Earth Solar Competition. To donate to help crowdfund solar panels for the winning school, and to help make it easier for many more schools to run on sun in the future, visit Donate to Run On Sun. So what would a world look like if every school had solar panels? This infographic is a glimpse of the positive clean energy future we can all create together – it’s one that our children and grandchildren can play a vital part in now and is guaranteed to have a real impact on the world they inherit. The new term has just begun and the sun is shining – what better time to embrace solar panels at YOUR school!